The spectacular stone fort of Dun Aonghasa is perched on the cliff edge of Aran Island; Inishmore, dating back over two and a half thousand years, beaten by the constant swell of the Atlantic Ocean. 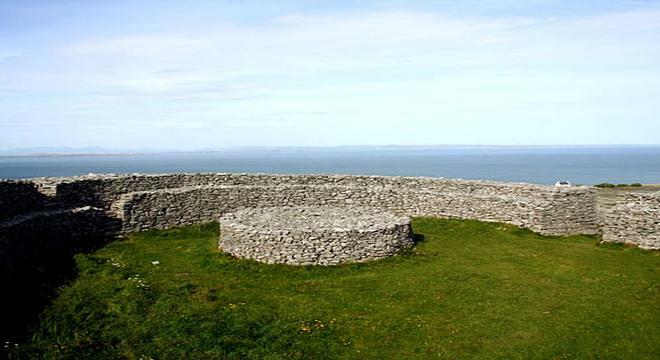 Dun Aonghasa is one of the most important and distinctive ancient sites of Ireland. A huge ancient ring fort seemingly cut in half by the sheer cliff face of Inishmore, at the mercy of the elements and the encroaching Atlantic Ocean. The late Bronze Age fort is a succession of stone enclosures covering some 14 acres, protected by an outer defence of jagged stone known as a Chevaux de frise. The outer enclosure spans far and wide and would have protected livestock, whereas the middle and inner enclosures were more defensive in purpose. The inner wall measures some 5m in width and would have been 6m high; it took some 6,500 tonnes of stone to build. At the heart of the fort, situated right on the cliff edge is a rock platform, which formed the focal point in the rituals and lives of those who dwelt here. Little is known of the fort's original inhabitants, recent excavations date the earliest human inhabitation as around 1500BC - 1000AD, though the most important period is believed to have been around 800BC. It is believed to have been the political and ritual centre for a group of peoples of common ancestry and only those elite members would have lived at Dun Aonghasa. However the name of Aonghasa comes from a much later period of the 5th Century when the fort was again inhabited. It is believed the name is associated with that of Aonghus Mac Natfraich, King of Cashel in the 5th Century, who had dynastic connections with Aran. Dun Aonghasa is a fascinating sight; an atmospheric place with unrestricted views along the battered Atlantic coastline of Inishmore and is the most prominent sight of the Aran Islands. Should you require more information on our Ireland vacations please contact us today. We also have a range of Ireland Honeymoon packages. March - October Daily 10:00-18:00 November - February Daily 10:00-16:00 Please note Dun Aonghasa is a particularly vulnerable site. Visitors are asked to co-operate with efforts to protect this monument.